ACT and The Center for Equity in Learning have been busy enhancing our capabilities to ensure our products and services are accessible to all. In August, the Center sponsored training for ACT team members on producing accessible documents, web pages, and web forms. This training extended previous Center-sponsored programs, and included more operational and customer-facing departments. We also engaged outside consultants to review and validate our efforts to make more web pages and documents accessible to the general public and to state and district customers. One of our key efforts was to launch a version of the ACT that can be accessed by examinees who use screen reader technology. The first administrations of the ACT with this format were a success, and provided valuable feedback for continuing improvements. Over the summer, the Center for Equity in Learning was proud to host an Accessibility Intern, Jalen Howsare. 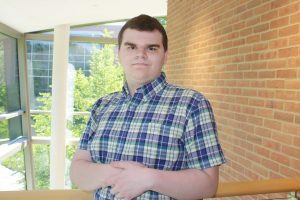 Jalen is a college student with a visual impairment who uses assistive technology such as a screen reader and a refreshable Braille display to access digital information. Jalen met with teams across ACT and answered questions about visual impairments, what it was like going to school, taking the ACT, his freshman year in college, challenges he faces, etc. He showed team members how he uses his Braille Sense device to help them understand his experiences. Jalen reviewed key web pages and several accessibility-tagged documents and suggested improvements for people accessing the site with a screen reader or Braille device. He also consulted with team members who were tagging documents on how best to tag graphics. For our Talent Strategy group, he reviewed accessibility of a new software product they are considering. Jalen took part in an ACT branding video and reflected upon his time as an ACT intern. He also gave feedback to our Facilities leaders on his experience on the campus and navigating the buildings and grounds. He provided valuable recommendations for improvements to make the campus more accessible. Jalen was not the first ACT team member with a vision impairment, but he was the first with complete blindness. The IT department gained valuable experience working with his devices and learning what was needed to support someone with a vision impairment. Even in the hallways or dining center, ACT team members would observe or interact with Jalen and learn how to interact with a person with a vision impairment. For some it was their first experience. Jalen enriched our work lives, and helped advance our understanding of the needs of people with vision impairments. His contributions have helped position ACT as a leader in providing accessible pathways for our customers.